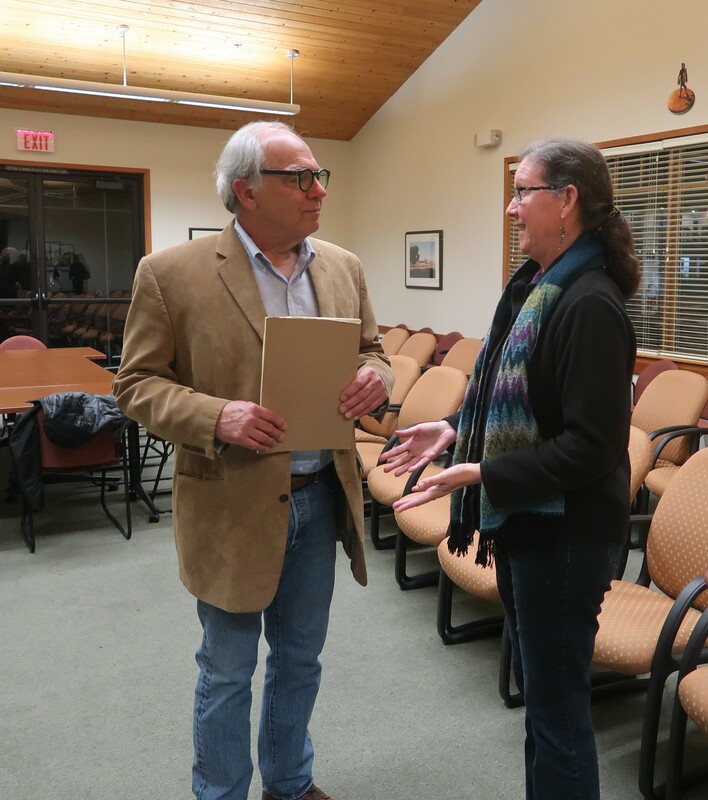 Rick Hawley spoke at the Cambria Forest Committee’s January 9, 2019 meeting, on climate change and the Monterey Pine forest. “Plant, baby, plant,” he told a group of about 20. Rick is a respected authority on Cambria’s forest, having spent more than 30 years devoted to it. He is one of the founders of Greenspace – The Cambria Land Trust. He served as a founding member of the statewide Pitch Canker Task Force, which included scientists and public policy experts from universities, agencies and the private sector, in addition to being a past member of the California Oak Mortality Task Force. He helped organize the fight against pitch canker and sudden oak death (SOD) and their devastating effects in California. He is a founding board member of the San Luis Obispo Fire Safe Council and the Cambria Forest Committee. He also served on the boards of the Planning and Conservation League and the Land Ethic Action Foundation and has been a member of the San Luis Obispo County Water Resources Advisory Council. Rick’s message was that climate change is affecting the forest, as well as the people who live in it. Hotter, drier weather, added to the forest’s loss of trees to development, threatens both the forest and our own state of mind. Planting trees to support the forest makes both the forest and the people who enjoy it more resilient. While Monterey Pine is commonly grown on plantations, natural forests are rare. Rather than protecting the species by listing it as Endangered, Rick advocated for protecting the habitat. Years of drought killed many trees. Lack of adequate water made trees vulnerable to infestation by bark beetles and other insects and diseases. Looking at the dead and dying trees left him feeling angry, anxious, helpless and hopeless. Removing dead or hazardous trees that threaten houses or roads is expensive. It’s another uncounted cost of global warming. Those dead trees and the invasive plants choking the understory create conditions for wildfire. “Our position on what’s happening is planting trees,” he said. With Greenspace’s seed bank increased by 30,000 seeds over the last year, Rick invited Cambrians to help grow seedlings. 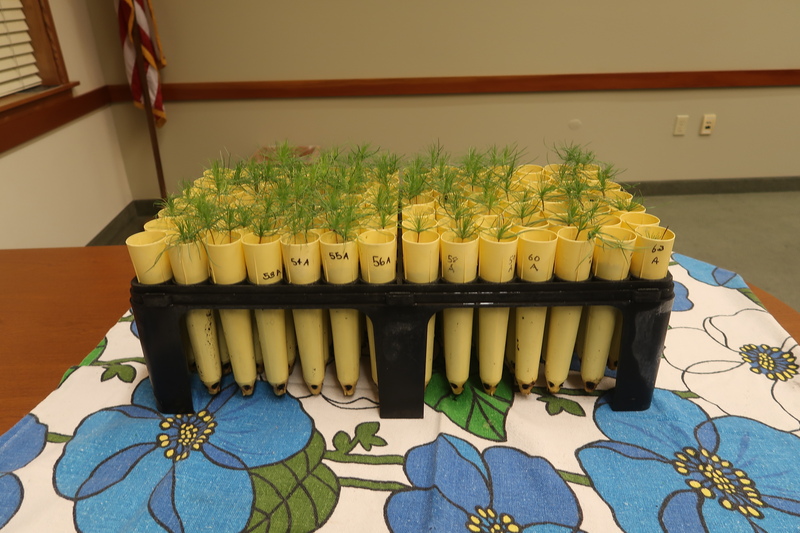 He brought a rack of planting cells to show how Monterey Pine seedlings can be grown. The recent $1.8 million grant for Cal Fire to remove dead trees and vegetation from the forest will open the forest for new tree growth. Maintenance keeps the forest healthy and improves its resilience in responding to changing climate. Cal Fire Division Chief Alan Peters said that although the seed repository in Davis has several pounds of seed, it’s more than 20 years old, and he isn’t confident that it is still viable. Over the years, hundreds of trees have been planted in Strawberry Canyon, Fern Canyon and the Fiscalini Ranch Preserve. Hiring a Forest Manager to implement the Forest Management Plan could provide unified local management. A healthy forest can respond to the inevitable challenges of varying rainfall and insect attacks. Fire Safe Council Business Manager Dan Turner said that he has observed that Monterey Pine are sensitive to fog, depending on it for moisture from fog drip. Rick agreed, remembering that the understory used to be deep green, that the forest smelled of rich decay. “It only takes one or two degrees to make a difference in fog,” Dan said. Climate change has reduced the forest area, changing its boundaries as the landscape converts to grasslands and oak woodlands. Cambrians who live in the forest enjoy its benefits. It enhances property values. It’s aesthetically pleasing. It provides habitat for wildlife, and recreational opportunities for people. Each mature tree provides $50,000-60,000 worth of services, by holding soil in place, shading houses. By planting trees, Cambria can continue to enjoy those benefits. When he formed Greenspace over 30 years ago, less than one percent of the forest was protected. Today, about 50 percent is under some level of protection. Greenspace has become an organization well respected in the community, and around the state. Greenspace provides seedling trees to the public, to comply with the replanting mitigation requirement of planting four pine trees for every Monterey Pine taken down. Greenspace provides the seedling, three years of care, and will plant the replacement tree, for $10. Without county enforcement of the requirement, few bother. Greenspace gets five to ten calls annually for replacement trees. “Greenspace is the official group that grows trees to replace them,” he said. While volunteer trees that start by themselves are more likely to succeed than planted seedlings, that location may not be suitable. Greenspace can find locations for new trees. The Cambria Community Services District has many undeveloped lots under protection, but has not allowed Greenspace to plant trees on them, to avoid the cost of maintenance. “Retired lots owned by CCSD are the ideal place to plant trees,” he said. Monterey Pine trees can live as long as 120 years, averaging 80 years. Planting trees out into grasslands can extend the forest. Trees do better with neighbors in stands, rather than isolated individuals. The root system, the most important part of the tree, is underground. The underground ecology of microorganisms and mushrooms transports nutrients up to the tree and returns sugars back. The natural biological cycles support the forest, allowing it to be resilient to changing conditions. One person attending questioned whether Strawberry Canyon, Greenspace’s 21-acres of forest, needs vegetation removed to reduce fire danger. Rick responded that Greenspace owns only 21 acres of the 50-acre canyon. Other owners are not maintaining their land as well as Greenspace is. Invasive plants, especially French broom, create flammable understory that can feed wildfire. Thick tree trunks are thousand-hour fuels, stopping grass fires. Other invasives, such as Cape Ivy, choke out seedling trees by covering the ground. Rick suggested using curtain burners to dispose of vegetation that is removed from the understory. Alan noted that Cal Fire bought six to use in high priority counties in the Sierras, but the burners require one to two acres of bare dirt around them for safe burning. Residents in the Cambria Pines Road area became concerned with burning of piles of vegetation recently. The vegetation was safely burned. Fire fighters see the change in their work. California now has fire season year-round. The forest is under pressure. Prepared by Christine Heinrichs, Cambria Forest Committee secretary.